Experianced mountaineers, hardened through many tough summer and winter ascents in the local and foreign mountains who have succesfully concluded a three year long training with programs set by the International Federation of Mountain Guides Association (IFMGA). Registered members of Slovenian Mountain Guide Association (ZGVS), with mountain guide identity cards equipped with a mountain guide logo, a guide number and engraved name of the guide. People from all walks of life: various educational backgrounds and various age groups who decided to take up their mountain guide job professionally as their full-time or part time job. 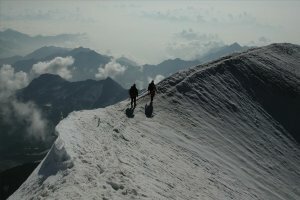 Why should you hire a mountain guide? Foto: Zvonko Požgaj Are you looking to go on an unfamiliar mountain tour with someone? Perhaps you'd like to try harder tours and you don't have an appropriate companion? Maybe you don't wish to join big groups but you don't feel comfortable enough to go alone or with your friends? Have you visited mountains only in summer time, but now desire to make a winter ascent or go backcountry skiing from the mountain top? You only know local mountains and you're tempted by foreign mountains. I can take you to any local mountain and many world mountains. At your professional work you need help from someone who finds his way in the mountains in all conditions. You wish to show our mountains to your bussiness partner and provide him the greatest possible safety. Where else can I help you? Choosing, buying or borrowing equipment needed for visiting mountains. 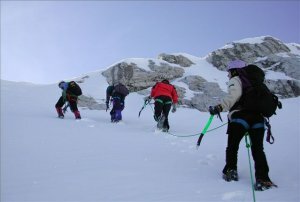 Teaching you mountaineering skills  I will prepare the course especially for you, your friends or your family. Mountain guide takes care of everything, your only concern is walking, climbing or ski touring and enjoying.